RGO maintains a staff of workspace planning professionals who can help achieve your office vision. We can help you decide on more than simply colours and patterns. We can be a valuable resource for ergonomics, overall office design and reconfiguration of your workspace. a complete bill of materials and budget pricing. The traditional design and specification process within the Dealer business process has been very costly in terms of people, errors, time invested per sales opportunity and ultimately, the customer experience. The traditional industry tools and our product structure required designers and others to understand and work with our products at a parts level. 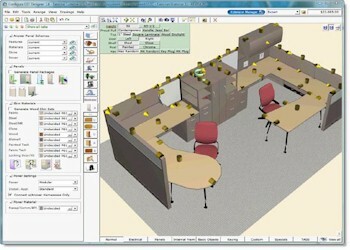 SmartTools speeds up responses to sales opportunities, while significantly increasing the quality of those responses through renderings, a complete bill of materials and budget pricing. At the same time, the software reduces specification errors on layouts and orders to an absolute minimum, while providing a direct link to both Hedberg and the Auto-pricing system.